What Is the Coffee Martini and Why Is It So Popular? National Coffee Day in the U.S. was September 29. On that day, coffee houses and cafés all served up their best coffee drinks in an effort to celebrate what is clearly our national beverage. Among the many concoctions coffee lovers enjoyed is what is known as the ‘coffee martini’. Yes, you did read that correctly. The coffee martini is a genuine drink served in bars and nightclubs all across the country. It is among a group of current coffee fads that also includes cold brew and herbal coffee substitutes. But unlike many other coffee fads, the coffee martini may just stick around for a long time. What is a coffee martini? It is an alcoholic beverage made with coffee as a base and served cold in a martini glass. The alcohol one mixes with coffee to produce the desired drink is left to personal preference. However, the most commonly chosen alcohol used to create this interesting drink is vodka. And why not? Vodka barely has any flavor of its own, so it is the perfect spirit to mix with coffee without inhibiting its flavor. Making coffee martinis is as easy as making any other mixed drink. Most of the time you start with hot coffee that gets poured over ice. But remember, this will dilute the coffee as the ice melts. Therefore, most recipes begin with espresso to take advantage of its concentration. After pouring the coffee over the ice, you simply add your alcohol of choice along with any other ingredients you might happen to enjoy. You could combine two fads by using cold brew coffee in your martinis. Then you wouldn’t have to worry about dilution because the coffee could be chilled before being poured over ice. You might also consider putting your alcohol in the freezer for a few hours beforehand. That way, the colder temperature of the alcohol will offset the warmer temperature of the coffee. There is no getting around the fact that the coffee martini is becoming a more popular drink as time marches on. As for why this is so, no one really knows. It could be that we Americans, who seem to love moving from one fad to the next, have been captivated by yet another way to enjoy America’s favorite beverage. The coffee Martini makes it possible for us to mix the drink that gets us going in the morning with one that keeps us going at night. It could be that the coffee martini is just a way for certain segments of the coffee drinking population to feel good about what they are drinking. Who knows? In the meantime, our goal at Galaxie Coffee is to serve our customers by providing the best coffee and beverage service in the greater New York area. We carry a complete line of hot and cold beverages along with breakroom supplies and more. As coffee fads go, there is nothing all that unusual about coffee drinkers wanting to find alternatives that will satisfy their desire for a flavorful beverage without increasing caffeine intake. More of them are turning to herbal coffee for that very reason. The beverage is similar to herbal tea in that it is made of various plants and roots, but there’s a dirty little secret about herbal coffee: it is neither a tea nor a roasted coffee product. 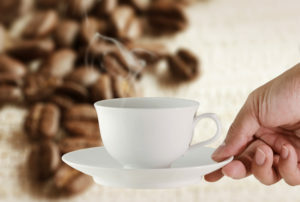 A better way to describe herbal coffee is to explain that it is a coffee alternative. There are many such products on the market, each one designed to provide a beverage with a similar flavor, color, and texture without all of the caffeine. Most herbal coffee products currently on the market are made with things such as dandelion root, chicory root, barley, carob, almonds, hazelnuts, dates and figs. Exactly how these ingredients are blended is up to individual roasters. What gives the blends the dark, rich flavor intended to mimic coffee is the roasting process. We looked around to see if we could find exactly where herbal coffee came from. Though the history of this beverage is sketchy, Italians have been drinking a beverage known as Orzo for generations. Orzo is a barley-based beverage that originated hundreds of years ago among peasants who couldn’t afford genuine coffee. These peasants began experimenting with roasting barley – no easy task, given how frail barley can be under heat. But they eventually figured it out. Today, Orzo is a common coffee alternative served throughout Europe. It remains very big in Italy, especially among Italians who love their espresso but know better than to have a cup in the hours preceding bedtime. They will now leave their espresso for the daytime and enjoy Orzo in the evening. Herbal Coffee in the U.S.
We Americans have not been as quick to embrace herbal coffee as our European and Asian counterparts. However, that’s not to say you cannot buy it here. You can, and it is growing in popularity. There are a number of established brands available at local supermarkets and specialty stores that also carry herbal tea and other specialized food products for advocates of healthy eating. As for preparing herbal coffee, that depends on the product you purchase. Some products are put in your coffee maker just like you would a standard coffee blend. Other products are steeped in hot water just like tea, and still other herbal coffees are instant – just add power to your hot water and you’re set to go. Herbal coffee is the latest coffee fad to emerge in the U.S. Here at Galaxie Coffee we are all about providing the best coffee, water, and other beverages to our clients regardless of their tastes and preferences. As fads come and go, we remain constant in our dedication to top-notch customer service and competitive pricing. Please contact us for more information about coffee service to your office.